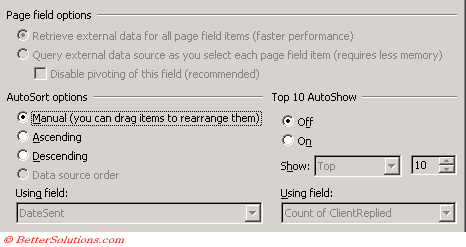 You can sort the data in a pivot table using the conventional sort buttons on the standard toolbar. Ascending - Sorts the data alphabetically from A to Z, 1 to 100, Jan to Dec and numerically from the lowest number to the highest. Descending - Sorts the data alphabetically from Z to A, 100 to 1, Dec to Jan and numerically from the highest number to the lowest. To sort a pivot table, select the field you want to sort and then select the appropriate button from the standard toolbar. You some reason the black arrow to indicate that you can select a whole field is not always available - external database ?? The AutoSort feature provides a way of sorting the data based on the actual values or totals in the table. This way the total with the highest number would always be displayed first. This feature takes precedence over the conventional sorting, so using AutoSort will disable any conventional sorting. (PivotTable > Field Settings), Advanced Options. You can switch it off by selecting manual.